The length and duration of this expedition definitely wears you down. Living in a tent at 17,400′ for weeks and weeks on end (and counting), eating the same types of food over and over and over again (Spam anyone? ), crawling in your cold, solitary tent night after night around 7pm and passing countless hours as thoughts drift to home is mentally exhausting. Missing friends, my beautiful girlfriend, family, good food, a warm, comfy bed, a toilet, a real shower, running water, soft drinks, beer, walking to the refrigerator and choosing something to drink or eat at will, warm weather, etc., all weigh considerably. Much of what lies ahead is completely unknown. How will my body perform above 24,000′? Will my physiology hold up? Will I have any strength left after deteriorating at altitude for the past 6+ weeks? Can I stay healthy over this next week to even put myself in position and have the chance to go for the summit? What will conditions be like up there when it’s our time? 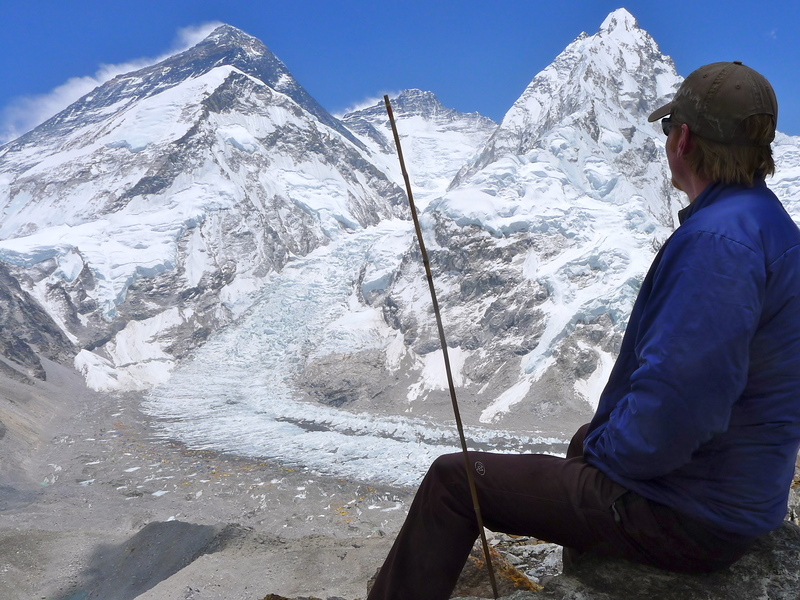 Will the icefall hold-up through the “heat” of late May and allow us safe passage? What the hell am I doing here?!? All of these questions, doubts, concerns weigh equally if not more than the tug of home, and all of the additional days at base camp don’t help. As I lay in bed each night and listen to the avalanches crash down off Nuptse and Pumori all around our base camp, I can’t help but wonder if one of those has my name on it in the days that are to come. These moments of self-doubt and introspection are inevitable on an expedition this long, but certainly grow exponentially while sitting idle. This is the mental test that is Everest. Physically, it is as demanding a climb as there is, but mentally it wears you down in ways that other mountains and other expeditions typically do not. At least not to the same degree. I fully expect to be pushed physically as I never have before in the next week or so. More than any other mountain I have climbed. More than any other physical endeavor to which I’ve dared to subject myself. Despite all of the health issues I’ve had to push through on this trip, the mental strain of the undertaking at hand, and the physical challenges that I am sure are ahead of me, I feel that I remain up to the challenge. I can only hope that the next weather window provides us a reasonable opportunity, the conditions on the mountain remain stable enough to allow us safe passage and that my body and mind are equal to the challenge. Wish me luck… I’m going to need it. I wish you all the best of luck on this last part of your journey. My heart is with you in Everest right now. Be strong, wise and please come back home soon. Love you! You are strong and you are prudent…don’t give in to the false audience in your head. This is all you. I’ve got a cold beer waiting for you at Coohill’s…toasting to your character and will. Since we are talking about Tom Petty (your headline post name) I will respond with another one of his lines. By the way I see all of your pics on Markwell, Bergerg, Remez, & Moniz facebook pages. The goatee is looking good. I know you are tired of all the garlic soup, chips, & yak cheese but stay laser beam focused. Wish I was still there and our prayers are with you. Thanks, bro. The goatee is more a function of shaving with cheap Nepali razors in cold Nepali water and I could endure pulling out only so many hairs. Heading up soon! Hang in there! We have all been eagely awaiting your posts here in Florida. I seriously cannot wait to read about the next and latest Everest update. We are living through your journey. Don’t lose sight of what you have dreamed of for so long! You have waited so long to get to this point and it is so close! People are so amazed when I tell them the stories of how my cousin is about to climb Mt.Everest that they are now following your posts. Your journey has been amazing and will continue to be even more so once you get to the summit! Go for it! Can’t wait to hear all about it! Be safe! Dig deep and you will prevail! !